Online ticketing site EventBrite reported a correlation between social media shares and gross ticket sales in 2012: In the U.S., a share from a Twitter user generated an average of $1.94 in additional ticket sales for a particular event. This doesn’t sound like much at first, but as this TechCrunch article points out, this is an “astounding metric, considering that every single one of those bits of marketing are essentially free.” We’d argue that, with the staff time (or the cost of a dedicated social media expert) needed to develop an effective social media strategy, it’s not exactly free money — but it’s certainly impressive when compared to the costs for traditional advertising. 1. Don’t forget: Tweets about tickets on sale should always include a link. Will you ever catch Fishtown’s @johnnybrendas posting linkless? Not on your life! 2. Last-minute tweets with a code for a special offer will help boost walk-up sales. The Pew Research Center’s 2013 report on arts organizations and digital technologies points out that with more people delaying decisions on how to spend leisure time, there’s a decline in advance sales and an increase in last-minute box office sales. Twitter helps capture those last-minute decision-makers. 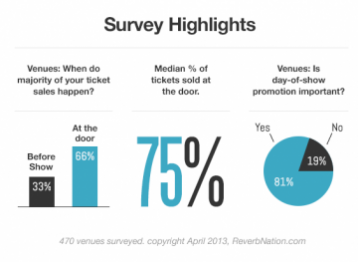 Check out a 2013 Reverbnation study of 470 music venues around the world: They reported that at least 75 percent of tickets are sold at the door. 3. New tools are making it easier for Twitter users to respond to a tweet by buying a ticket. New startup Chirpify, founded in 2012, allows consumers to connect their Twitter and Paypal accounts, enabling direct purchasing from a Tweet. Read Part 2 on using Twitter to sell tickets here.